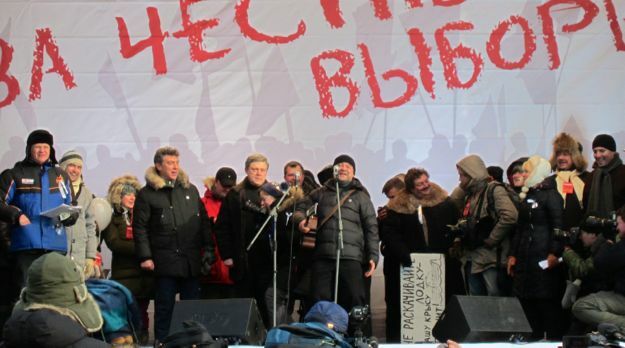 Yuri Shevchuk at the microphone during a protest in Moscow in 2012. Photo by Bogomolov PL, used via Wikimedia Commons. As the news is filled with escalating tensions in Ukraine—now including direct Russian military intervention, we will turn the attention of Read The Spirit’s Interfaith Peacemakers to some heroes from this corner of he world. We look at Ukrainian protesters on the streets and a Russian musician who put his protest in both song and public action. Interestingly I first heard about Yuri Shevchuk from two Ukrainian friends. So in hope of peace between Russia and Ukraine we tell these stories. Photo used with permission via Wikimedia Commons. In 1980, an art teacher co-founded a rock band that would launch him toward becoming one of the best-known personalities in Russia. The art teacher was Yuri Shevchuk. The rock band was called DDT. They originated in the city of Ufa, a conservative center in the Ural Mountains of the Soviet Union. They began recording and distributing cassette tapes of their music as part of the underground music scene. Occasionally they performed in officially sanctioned venues. One of the early songs Shevchuk wrote was “Don’t Shoot” in protest of the Soviet war in Afghanistan. The song tells of a boy growing up shooting birds and little animals and winning prizes in shooting galleries. Then, as a soldier, he is sent to a hot spot. DDT entered a major music competition. They included “Don’t Shoot” among their submissions and made it to the finals in Moscow. However, a message like “Don’t Shoot!” while Soviet troops were in Afghanistan, caught the attention of the Soviet KGB. Soon the band members were followed and monitored. Their music was banned, making them even more popular to the young people who passed bootlegged tapes to each other. DDT participated in a “Rock for Peace” festival, but their music was cut out of the televised production because of their illegal status. 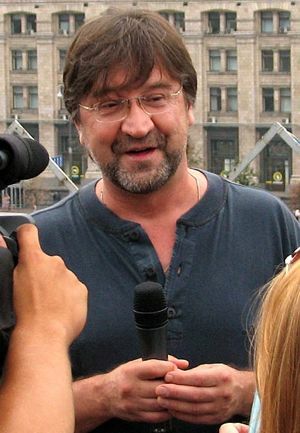 Shevchuk, the lead singer and songwriter for the group, moved to Leningrad, now Saint Petersburg, in 1986 to get closer to the heartbeat of Russian culture. The band went through cycles, breaking up and reorganizing with Shevchuk remaining the one constant. As the winds of freedom began to blow through the Soviet Union, DDT traveled across the Soviet empire. In 1988, the band traveled to the U.S. and played for MTV. In 1994, DDT was named Rock Band of the Year and played in front of more than 120,000 fans at a free concert in Saint Petersburg. They continue to be the most popular group in Russia, increasing their following in Europe and the United States. Shevchuk has a distinct gravelly voice, and his lyrics take a humorous look at life in Russia, sometimes with pointed thrusts at injustice and war. He despises the triviality of pop music, yet has become more popular than any pop musician in Russia. DDT concerts are known for the thousands of people in the audience joining in to sing the familiar lyrics. Shevchuk also includes poetry readings within the set list. Their recordings are a mix of rock and blues, flavored with influences from Russian folk, classical and even religious music. Shevchuk doesn’t consider himself a political activist, but he honestly addresses the problems of life in his homeland—so effectively that he was branded a dissident. “The country is falling into a chasm, and we are laughing as loud as we can, lying about in rusty Jacuzzis like the ancient Romans, observing the end of the empire.” Speaking of one of his songs about war, he says, “It’s a battle for an enlightened understanding of life, where the colonel is spirit, and the soldiers are poets.” He says, “Rock music is freedom, it is internal freedom,” so he refuses to play for politicians or businesses, but he will play countless benefit concerts for community organizations. Besides their lyrics, Shevchuk and the band have made their performance sites and programs into powerful and provocative statements. During the war in Chechnya, he performed more than 50 concerts on a mission of peace, playing for both Russian troops and Chechen civilians. During the war between Russia and Georgia in 2008, Shevchuk organized two peace concerts in Moscow and Saint Petersburg. Harkening back to the days of the war in Afghanistan and one of their earlier hits, he called the concerts “Don’t Shoot.” He brought together Georgian and Ossetian musicians (South Ossetians wanting to break away from Georgia were supported by Russia) and Ukrainians, and together they were called “Peacekeepers.” Profits from the concerts were sent to relieve the suffering of both Ossetian and Georgian victims. Using the platform of his popularity, Shevchuk calls Russia to constructive relationships with its neighbors. “What is patriotism and love for Russia? It’s no good idea that patriotism should be bred on antagonism: alternately we get at war-like relations with Ukraine, Georgia or Baltic states. That’s no patriotism, that’s chauvinism.” DDT went to western Ukraine, where anti-Russian feeling has been strongest, and played a series of concerts for tens of thou- sands of people. They sang in Russian and Ukrainian affirming to cheering crowds that the two nations are brothers and sisters. Shevchuk says if Russia would meet others with a smile, the world would breathe so much easier. For more than 25 years, throughout all the political changes and the reorganization within his band, Yuri Shevchuk has remained in the forefront as one who artistically speaks the truth in Russia. His music has created a space for people to talk about what is happening around them and to them. He sings with love and earthiness, and calls people to higher dreams. This profile on Yuri Shevchuk comes from the pages of my book, Blessed are the Peacemakers. Blessed are the Peacemakers is one of the three books that inspired this website. Learn more about Daniel Buttry’s series of books on global peacemakers.